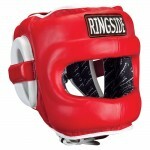 People who are new to boxing tend to start with the minimum of gear and subsequently don’t perform well. Athletic footwear is okay as a starting point, but wearing proper boxing shoes provides a new way to develop good footwork which helps become a moving target rather than a stationary one. As well as looking correct in the ring, a pair of boxing shoes offers more comfort, greater flexibility, and improved power through the ability to plant the feet before throwing a hook or right cross. The type of movement that boxers make frequently is benefited by the design of boxing shoes. Having to fork out for shoes along with all the other boxing gear may seem like an expensive extra that isn’t required, but it’s actually one of the most important things to purchase. Anyone who has been training as a boxer for more than a month or more would be wise to consider their options. Boxing shoes are not as expensive as one would think and there several good brands to choose from when shopping for them. 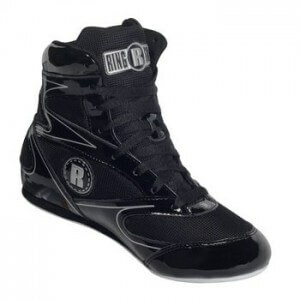 The Title Boxing Title Lo-Top Boxing Shoes come in a choice of either red or black colors. Other inexpensive brands offer a far wider choice of colors, but for boxers who want something simple, this will suffice. The size choices range from 2M US up to 13. There is sometimes no size 13 M or size 9. Unfortunately, no half sizes are catered for here. The shoes mostly fit comfortably, with a few people finding it too small for the size they selected. As a result, it might be a good idea to choose one size higher than your normal shoe size to get the right fit. The shoe is emblazoned with the Title logo on the ankle at across the back of the heel too. The boot is a low top design which combines a nylon weave for better breathability and synthetic leather upper. The polyurethane soles sport a design ideal for the art of boxing. The boots are built for nimble fighters who won’t want to feel that their choice of footwear is slowing them down. These boots are intended for light workouts. Ideal for beginners, they inner sole is likely to work free over time. The sole is thin, so it’s possible to feel the ground more when working out or during a fighting match with them. Women boxers can also use this shoe, just be sure to order up one size to get the right size for your feet. Overall, these boots won’t last forever. They are not really designedfor top-end shoes, but for newbies and people who don’t box that often, they’ll be just fine. 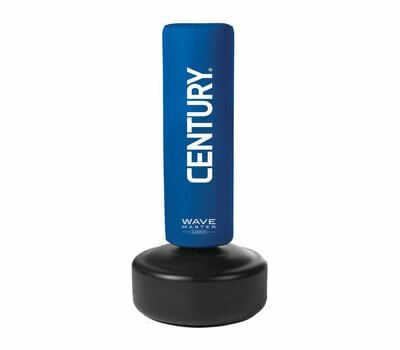 Anyone who’s a regular at the boxing gym and needs something durable may wish to invest in something better. The shoe sizes range for 6 up to 15. There is currently no 12 size in some colors. Rival does not offer half sizes in this shoe model. This boxing shoe is a colorful one with a black fabric, synthetic mesh and microfiber across the sides and front top of the shoe through every color variation. The surrounding areas use the color choice for the shoe, but the black mesh stays the same. Mostly black laces are used, but this is occasionally changes when a brightly colored model is selected, like the yellow snake skin model. Weighing 390 grams and a 5.5-inch height, the low top shoe is designed to offer sufficient ankle support while still delivering flexibility where it counts. Cowhide suede is used for the non-mesh areas of the fabric which gives it more durability that cheaper boxing shoes that are all synthetic. A mesh sock liner allows more air to enter the shoe and move around the keep sweat down to a minimum. The sole is designed to be ergonomic with plenty of grip without being too stuck to the canvas during a fight. The cushioning on the sole is good enough to jump rope and not hurt the balls of your feet. The shoes aren’t especially wide, so people with wider feet may need to order a size up. The break in period for the shoes is also not too long. The Ringside Diablo Muay Thai MMA Wrestling Boxing shoes (what a mouthful!) are, as one can already tell, intended to play quad-duty. 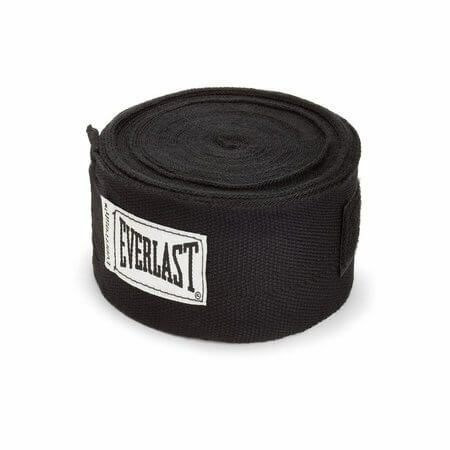 A shoe designed to work well for Muay Thai matches with their punches and kicks, mixed martial arts, wrestling where grip is important, and boxing to is a tough ask. Th e shoes are low top for good ankle support, but the excellent movement. The pink color is obviously ideal for women to use for certain types of sports unless they don’t wish to stand out that much. In which case, there are seven other gender neutral colors to pick from. The size range runs from 2 up to 13. This is especially wide and really useful for small footed male fighters, and female fighters especially, who may have tiny feet. There are no half sizes offered, which is fairly typical with shoes suitable for boxing. The female sizes are measured two sizes lower, so a woman who is normally a size 6 should pick a size 4 with this shoe. The shoe using a vinyl leather appearance which is shiny and reflective. On the part of the side and ahead of the front toe is their mesh nylon which allows for better breathability to keep the feet temperature down at acceptable levels. The mesh color also changes to match the shoe color selected. Only the black boot uses black laces, with all the other boot colors features white laces to create some contrast. Many of the colors are pretty garish. The sole is made from rubber and is designed not to slip in the ring. There is a good amount of grip to the sole without being overly stuck on the canvas preventing good footwork to avoid overhand rights. The Adidas Box Hog 2 Boxing Shoes sports the classic branded look from the company of black shoe with white diagonally stripped markings. Anyone who is familiar with the brand will know the shoe is by Adidas regardless whether they see their logo or not. The model offered here is a black one in U.S. size 9.5 male only. Other shoe sizes for this model may also be available on Amazon. The shoe is a high top with ample ankle support and is long enough to cover part of the calf muscle too. The main exterior material is a synthetic suede that offers a secure fit. One layer of black mesh is incorporated along the heel rising near the top of the shoe and along the sides up to the toe. The mesh ensures better breathability to keep the feet cooler to avoid sores and blisters occurring.The EVA midsole delivers a strong cushioning in the heel and along the middle of the foot. The outsole is made from a rubber with wavy lines across it, as it is common with Adidas footwear, to grip the floor surface better. The sole is actually fairly thin and wears through faster than one might at first expect. For light workouts over time, this shoe is a good one, but for long-term boxing workouts and fights in the ring, there may be better choices. 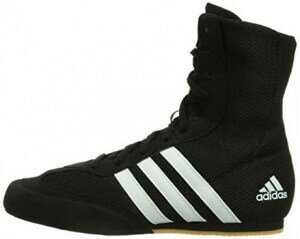 Many people swear by the quality of Adidas footwear for combat sports. Their texture, materials, and rubber for the sole is often some of the best available in the industry. This shoe model is dispatched from the UK. The Ringside Undefeated High Top Muay Thai MMA Wrestling Boxing shoes are designed as a high top version to offer ample support for the ankle, and lower leg areas. The model is sold in black and white (and gray) colors. There are no other colors available. 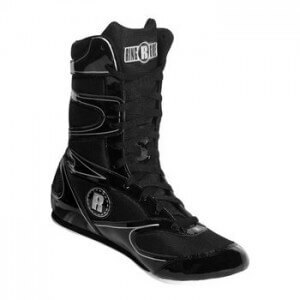 Th is high top boxing shoes l is designed for use with boxing, wrestling, MMA and Muay Thai, so anyone who plays around with mixed martial arts, as well as boxing, will find these a good money saver vs. buying several pairs of different combat sports shoes. The size range is between size 2 and 13. This is especially wide and makes the shoes available for people with smaller feet. There are no half sizes on offer here. For women, they should consider ordering 1.5-2 sizes smaller to get a shoe to fit them perfectly. The higher top offers better support for people who are worried about turning their ankle during warmups, practice or a real fight. The use of a vinyl leather finish provides some style to these shoes. They’re light enough to be used by youngsters who are not even teenagers yet and trying out boxing or a martial art for the first time. They come with long laces that criss cross at the front. The Ringside logo is shown in full at the top of the front tongue and with an R symbol at the side near the ankles. The boots are stylish and cool to wear. The pricing is fair and not overly expensive either. They will breathe well during long sessions in the gym too. The grip on the canvas is best with boxing shoes. The grip prevents sliding which would put you out of position and at risk of taking a bad shot. The grip is not so sticky though that it prevents a boxer turning on their heel to twist around to get a good punch with excellent follows through. Just like Ali was known for his terrific footwork, it’s not possible to emulate this style without boxing shoes. The main reason for this is sneakers have grip on the front to stop quickly when fast running. 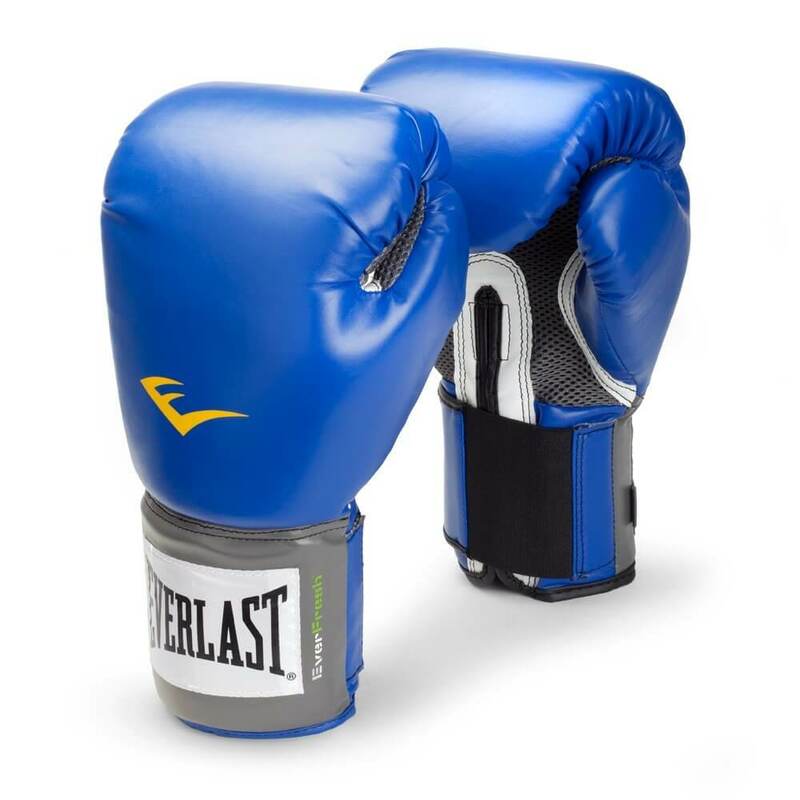 However, boxing footwear lacks the grip on the tip making it far easier to pivot during a boxing match and place the feet where they’re needed. Each shoe has a different amount of grip. Some boxers prefer a shoe that is grippier than most; others prefer one that is less grippy. It is a personal choice for each fighter. The sole at the bottom of the shoe is one of the most important parts to its construction. It needs to be balanced nicely and padded well enough to feel light on the feet. At the same time, a shoe shouldn’t feel like each foot is so planted on the ground, that it restricts your movements. The thickness of the sole determines how soft it feels and whether you’ll feel the ground when moving around or not. Some fighters enjoy the feel of the mat, whereas others do not. It’s a good idea to bear in mind that with a thinner sole, they’re more wearing on your feet, so a long training session could cause more blisters and sores. 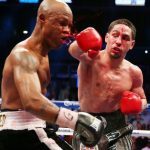 Unlike with basketball and other sporting shoes that have thick soles to avoid any feel of the ground, boxing shoes should lean in the other direction. The texture is also important here. The sole will either be smooth or have little bumps that help it get purchase on the ground. It is often a personal decision which type you prefer, and you should listen to your gut. The smoother surface is certainly better for feeling more connected to the ground than a non-smoother surface is. A covered toe with a thicker wrap is one option. The other is to have a simpler design that is less flamboyant. The thicker toe covering contributes to the feeling of better grip. With boxing, you always want to feel light on your toes but also in control of your position at all times. A shoe must feel light enough without feeling like your floating across the mat. The thicker the material, with more durable uppers, but the heavier the shoe will feel when moving around. As the legs get tired during a lot fight, even how heavy the materials have come into play. The thicker, weightier shoe has a nice feel to it, as it supports the foot and ankle well, but it also gets harder to move around as one gets more tired. It’s the eternal trade-off for every boxer. Twisting the ankle is one of the easiest problems to have. Turned the ankle during a fight means it is over and the match is lost. Given that injuries to the ankle are one of the most common ones in the fighting sport, supporting the ankle is the priority. The height of the shoe and the padded support of the ankle is an issue for new fighters who haven’t gotten their footwork down properly. Shoes are designed with either a low, middle or high support height to protect the ankle. During a boxing match, the ankle is put under pressure from all directions, so the more support provided it, the better. For improved ankle support, higher tops are better. Conversely, low tops provide greater flexibility at the ankle, but far less support all around the ankle to ward off ankle sprains and more serious injuries. The more frequently that you sprain your ankle, the higher top you should look for with a pair of boots. Now we have some subtleties. With lot tops, there are still variations in the height and amount of ankle support. Low tops may sit below the ankle, at the ankle height or above the ankle. It all depends on the shoe and the manufacturer. For someone who is focused on low tops, the subtleties are important. For high tops, some are looser around the ankle while still offering enough support. Other ones take up part of the calf muscle and can feel restrictive towards it. It depends on how long your calf muscle is as it how a high top will fit on the foot and leg. The width of the shoe and its overall comfort matter considerably. The stitching should be good quality to ensure it is durable. The construction should provide comfort when moving around. The foot undergoes considerably varied movement during a fight, and the shoe must adjust its shape to match rather than seem to be fighting against the fighter’s foot. Getting the right fit is important too. Too tight at the front and they’ll pinch your upper foot. This gets in the way of using the balls of your feet to push forward when you need to. For other fighters, the width of the shoe is the sticking point. If the shoe isn’t wide enough for your foot, you’ll have difficulty with movement, you won’t feel comfortable and will develop sores and blisters eventually. Any serious fighter is going to be using the same pair of boxing shoes for a while. Cheaper, ineffective shoe manufacturers cut corners to provide a less expensive model. The cost-cutting is evident in the materials used, the construction, padding, and also the design too. There is far more shoe glue needed to glue a boxing shoe back together when buying too cheap. Nike–The company makes many types of athletic shoes; not only sneakers for general use. Their Nike Lo Pro Boxing shoes are lightweight, that don’t slip on the canvas and are inexpensive. Nike also makes other types of shoes for boxers like their HyperKO boots for boxing which is expensive, but some fighters swear by them. Adidas – Long a champion of soccer boots, Adidas has a different feel with their boots than Nike does. The brand is better known in Europe than in the U.S., but their quality is good. Their traditional white diagonal striped design is common with their brand and evident in their Box Hog 2 boot we reviewed above. They also have the Champ Speed 3, which are less expensive. Most of the Adidas boxing shoes are either the medium top or higher top. 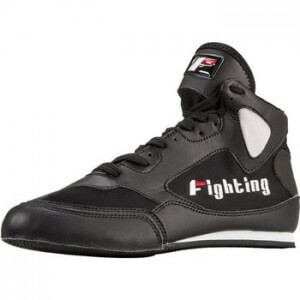 Their Combat Speed IV is the exception being light, thin, low top boots for boxing. 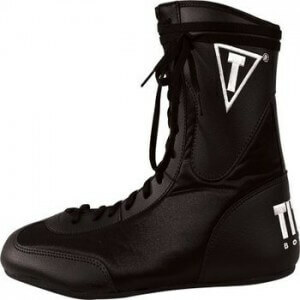 Title Boxing – The brand tends to offer men’s boxing shoes on the lower end of the price range. As such, their shoes are good ones to get started with or to test out which style feels right to you. Buying a more expensive brand when you’re not sure how much ankle support you’ll want can be an expensive mistake. 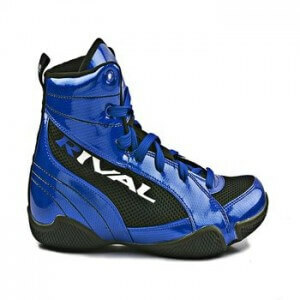 Rival Boxing – The company offers some of the most colorful shoes on the market. The use of synthetic fabrics and light materials is evident here. The price point is low because of the less expensive basic materials. The brand offers low top, medium top and high top boxing shoes.Their Rival Guerrero boots are low top and popular. 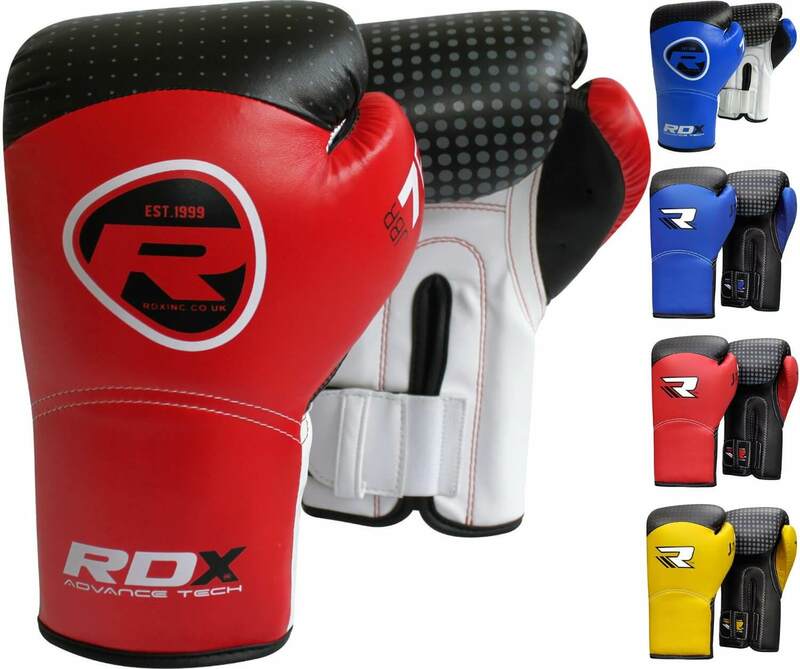 The Rival RSX boxing boots are high top and come recommended also. Ringside–This brand has been around for decades. They make everything from boxing shoes to head protection to boxing shorts. Their boxing shoes often make use of rubber soles and nylon mesh for breathability. Their shoes for boxing don’t always look the same as with other brands and sometimes are also usable for MMA or wrestling too. Choosing the right pair of boxing shoes is a personal decision that shouldn’t be taken lightly. It often takes buying several shoes before choosing the proper style and fit suits your feet best. It’s a process that all new fighters must go through to get the footwear they feel the most comfortable with.Hope this guide helps you to find best boxing shoes!